Oh Montana! For our first stop in our adopted home state of Montana, we hit the Bighorn River near Ft. Smith. 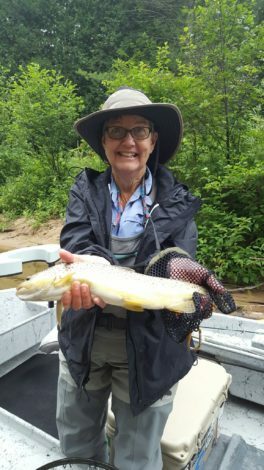 We’d heard stories and had read about how great a fishery the Bighorn is, but we’d not fished it here in the Ft. Smith area where it is most well known. What we know firsthand now is that all the stories are true. Epic is a word that gets thrown around a lot in the fishing world so we try not to use it freely and save it for the truly amazing days. For us, epic doesn’t mean biggest fish ever, or even most fish ever (although that certainly helps) but means a day of great fishing and fun. So….. our trip on the Bighorn with Merritt Harris of Bighorn Trout Shop was truly EPIC! We started out just below Afterbay Dam and fished our way down to the Three Mile Access takeout. In between, we fished from the boat but waded in certain holes along the way. In both cases, big wild brown and rainbow trout were fought and netted. More importantly, we had a guide, Merritt, who made the day not just productive for sure, but so much fun. Merritt is one of the most requested and hardest to get guides on the Bighorn. Not sure how we were so lucky to have him as our guide, but we’ll definitely be back to fish with him again. I’d highly recommend that if you’re coming to fish the Bighorn, call the Bighorn Trout Shop and ask for Merritt. For now, enjoy this interview we did with him parked in some shade along the Bighorn. If you look closely, you’ll even see a fish rise to eat a black caddis. Enjoy! What makes a “Top Trout Town”? In 2009, Forbes Magazine published its list titled “North America’s Top 10 Trout-Fishing Towns“. The author admitted that it was totally subjective but listed out 10 communities rich with trout fishing opportunities. Fly Rod & Reel published its list of the “Top 10 Trout Towns” with some criteria: Pitfalls, Big Draws, Best Eats, After Hours, Kick Start with Caffeine, and Kicking the Dirt. A book has even been written about the subject by Bob Mallard, “25 Best Towns Fly Fishing for Trout“. As we travel around on our River Ramble, we are visiting many of the towns in these publications and more. Of course, we are finding our own criteria for our own personal “Top” list, including important characteristics like: local watering holes, best local beer, great local coffee, unique local eats, fly fishing economic benefit to the community, best live music, etc… We’ll share more on all of these along the way and will likely be changing our minds along the way as we visit more and more of these locales. 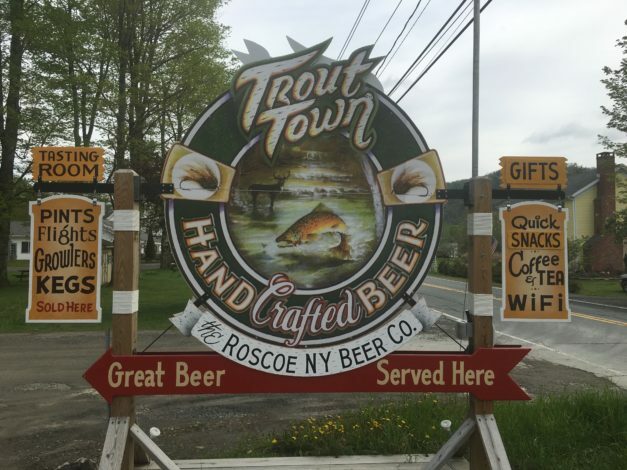 To date, we’ve visited trout towns that are on most “Top” lists including: Asheville, NC; Roscoe, NY; State College, PA; and Grayling, MI. Absolutely all are great but they also are all different. Asheville is a major city with a large regional university and very diversified economy. 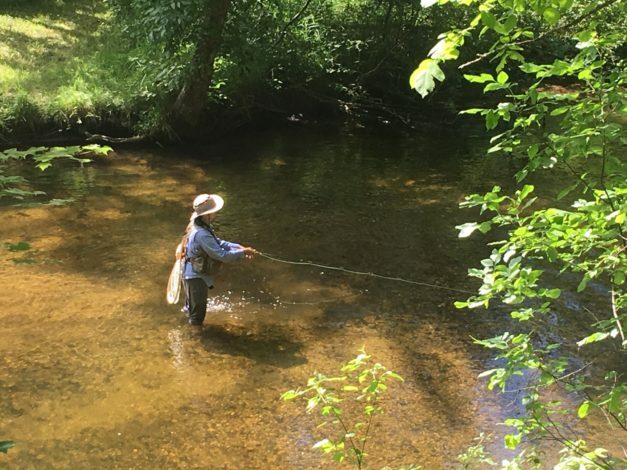 It happens to set close to some of the most incredible trout fishing in the east. It’s the largest city in an area I’d like to suggest become a new state devoted to trout fishing. It would include Northern Georgia, Western North Carolina and Eastern Tennessee. There are numerous “TU Top 100” trout streams in the area. While Asheville is awesome, we actually enjoyed a much smaller community that someone described as “Asheville 100 years ago”, Sylva, NC. It’s closer to most of the NC trout streams, has a main street with multiple fly shops, has some unique local eats, multiple local breweries and a great live music scene. 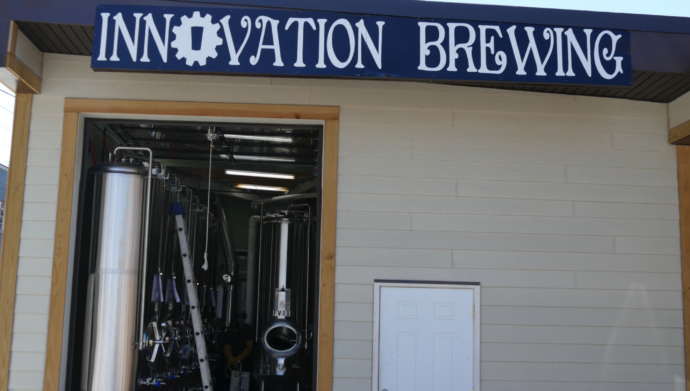 If you’re in Asheville, take a trip out to Sylva and visit Innovation Brewing, grab a meal at Evolution Wine Kitchen (yes, they have a great selection of craft beers and great food pairings for it) and if you’re lucky, go listen to Bird in Hand playing nearby. Roscoe, NY, bills itself as “Trout Town USA”. Banners up on main street proclaim this proudly as do signs in many of the towns businesses. The Roscoe Beer Company is in town and distributes a very nice Trout Town American Amber Ale that I sampled liberally. Just down the road is Catskill Brewery. The Roscoe Diner is a fixture among fly fisherman in the area. The town supports 4 fly shops that lure fishermen with everything they’d possibly need. Guides abound for fishing area rivers with drift boats on every corner of town. We had the pleasure of working with the team at Ken Tutalo’s Baxter House River Outfitters. Two of the three TU Top 100 Trout Streams flow right through Roscoe and a third is a short 15 minutes away. State College, PA, is the home of Penn State University and we’re told it’s also known as “Trout Bum U”. Within an hour drive are three of the TU Top 100 Trout Streams. 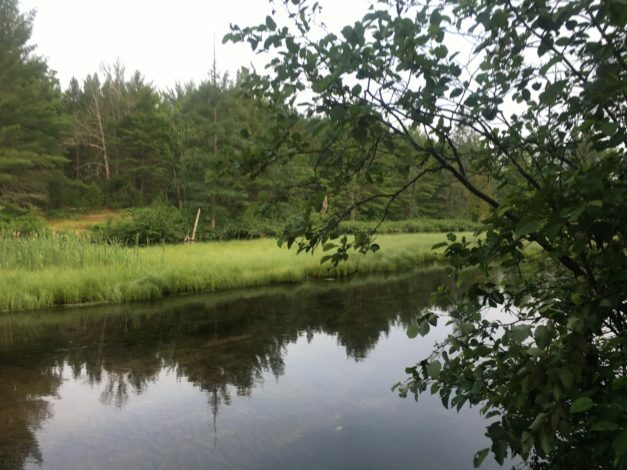 If you go out to an hour and a half, you add 3 more TU Top 100’s and at least 3 other trout streams that could have been on the list. Being a university town, you have all of the benefits that brings, including some great local breweries like Happy Valley Brewing Company. You also have a PSU Ag Department creamery on campus that serves up some of the best ice cream you’ll ever find. TCO is a great local fly shop that provides great flies, supplies and most importantly, info on where to fish. We spent two weeks in the State College area and could have spent 2 months…. easy! Finally, we just visited Grayling, MI, which has the Au Sable River flowing right through town. 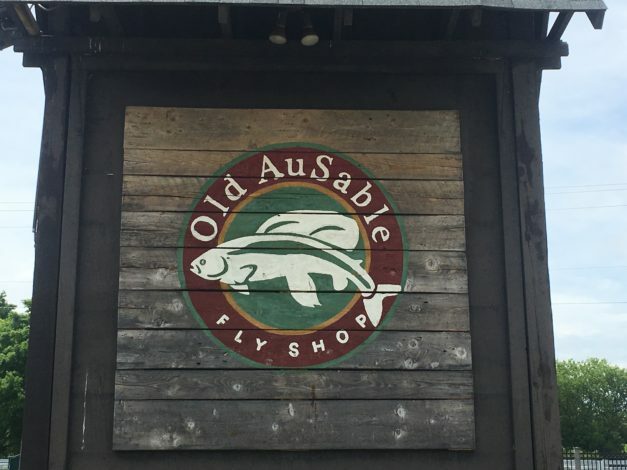 Old Au Sable Fly Shop sits right on the river and provides everything you could need for fishing the area. 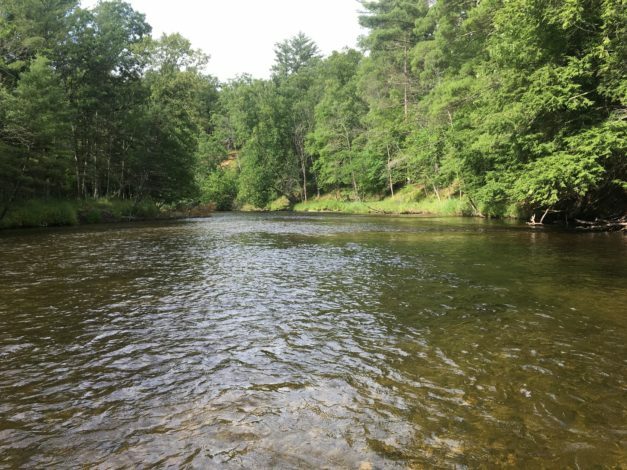 Just outside town, flows the Manistee River, another of the TU Top 100. 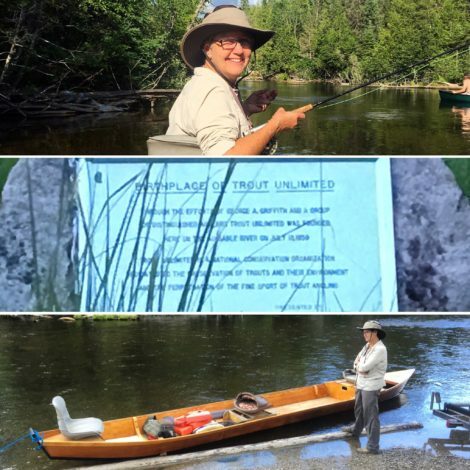 The Au Sable is home to the founders of Trout Unlimited itself. Couldn’t really find any “local beers” but did find a great local eats spot, “Spike’s Keg O Nails” which celebrates the town’s fly fishing and paddling heritage. The are proud supporters of the annual canoe race on the Au Sable. To satisfy your sweet tooth, the Goodale Bakery in town has everything…. and I mean EVERYTHING! They are even a distributer for Albie’s Pasties, a northern Michigan concoction that was scrumptious. What we found in Grayling was that while it is a great town with two world class trout streams, it’s really more of a paddlers town with more kayak/canoe rental shops by far than fly shops. If you pinned us down according to our criteria at this moment, we’d probably say Sylva, NC should be on any “Trout Town” list just as much as Asheville. We love Asheville but Sylva was closer to the fishing and more intimate. But so far, if you wanted to say pure “Trout Town”, they’ve already coined it, its Roscoe, NY. 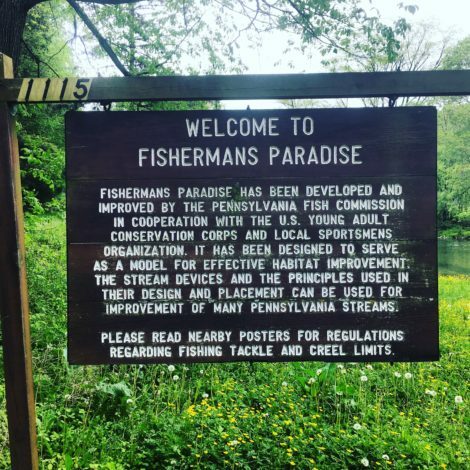 If you wanted to fish a dozen or more quality trout streams in an area, State College is your town. If history, some cool river boats, an incredible hex hatch and some paddling is on your list, head to Grayling. This year, we’ll also be visiting towns on most “Top” lists including West Yellowstone (MT), Bend (OR), Jackson (WY), Ennis (MT), Missoula (MT), Bozeman (MT) and Hailey (ID). We’ll also be reporting on other “Top” towns we find along the way. We have a favorite but will save it until we fish there…. so stay tuned…. and….